Steven E. Aschheim holds the Vigevani Chair of European Studies at the Hebrew University, Jerusalem, where he teaches cultural and intellectual history. He is the author of Brothers and Strangers: The East European Jew in German and German-Jewish Consciousness, 1800-1923 (1982); The Nietzsche Legacy in Germany, 1890-1990 (1992); Culture and Catastrophe: German and Jewish Confrontations with National Socialism and Other Crises (1996); In Times of Crisis: Essays on European Culture, Germans, and Jews (2001); and Scholem, Arendt, and Klemperer: Intimate Chronicles in Turbulent Times (2001). Peter Baehr teaches in the Department of Politics and Sociology, Lingnan University, Hong Kong. His publications include Caesar and the Fading of the Roman World (1998) and Founders, Classics, and Canons (2001). He is also the editor of The Portable Hannah Arendt (2000). Richard J. Bernstein is the Vera List Professor of Philosophy and chair of the Department of Philosophy of the New School for Social Research. His recent books include Freud and the Legacy of Moses (1998); Hannah Arendt and the Jewish Question (1996); and The New Constellation: The Ethical-Political Horizons of Modernity/Postmodernity. He is currently a fellow of the Wissenschaftskolleg zu Berlin, where he is working on a book dealing with the problem of evil. Leora Bilsky is a senior lecturer on the Faculty of Law at Tel Aviv University and has recently been a fellow at the program in Ethics and the Professions at Harvard University. Her main areas of interest are feminism, law and philosophy, political trials, and the Holocaust. In her work on political trials she has looked at the history of Israeli law and the legacy of the Holocaust and the work of Hannah Arendt. She is the editor of a special issue of Theoretical Inquiries in Law on "Judging and Judgment in the Shadow of the Holocaust" (2000). She is currently writing a book tentatively titled Political Trials: The Struggle over Israel's Collective Identity, forthcoming from the University of Michigan Press. Richard I. Cohen holds the Paulette and Claude Kelman Chair in French Jewry Studies at the Hebrew University of Jerusalem. He is the author of The Burden of Conscience: French-Jewish Leadership during the Holocaust (1987) and Jewish Icons: Art and Society in Modern Europe (1998). In addition, he is the editor of the diary of Raymond-Raoul Lambert, Carnet d'un témoin, 1940-1943 (1985) and The French Revolution and Its Historical Impact (1991, Hebrew) and coeditor of Art and Its Uses: The Visual Image and Modern Jewish Society (1991); From Court Jews to the Rothschilds: Art, Patronage, and Power, 1600-1800 (1996); and the Historical Society of Israel's quarterly journal Zion (Hebrew). Bernard Crick is emeritus professor of politics and honorary fellow of Birkbeck College, University of London, and of University College London. Among his books are In Defence of Politics (5th ed., 2000); Political Theory and Practice (1973); George Orwell: A Life (1980); Essays on Politics and Literature (1988); Political Thoughts and Polemics (1989); Essays on Citizenship (2000); and Crossing Borders (2001). Michael Halberstam is author of Totalitarianism and the Modern Conception of Politics (1999). He taught philosophy at the University of South Carolina for four years. During his final year in the philosophy department he was a Mellon Fellow at Wesleyan University's Center for the Humanities. He is currently completing a law degree at Stanford University. Agnes Heller teaches philosophy at the New School for Social Research in New York. A student of Georg Lukács and a Hungarian dissident, she is the recipient of the Hungarian Szechenyi National Prize and the Hannah Arendt Prize. She has received several honorary degrees and is the author of several dozen books. Among these are A Philosophy of History (1993); An Ethics of Personality (1996); A Theory of Modernity (1999); and The Time is Out of Joint: Shakespeare as Philosopher of History (2000). Walter Laqueur is university professor emeritus at Georgetown University. He was director of the Institute of Contemporary History and Wiener Library in London from 1965 to 1991 and the founder and editor of the Journal of Contemporary History. He has been serving as chair of the International Research Council at CSIS Washington. Among his books on German, Russian, and Middle Eastern history in the nineteenth and twentieth centuries, the most recent is Generation Exodus (2001). Yaacov Lozowick is the director of the Yad Vashem Archives in Jerusalem. He is the author of Hitler's Bureaucrats: The Nazi Security Police and the Banality of Evil (German, 2000, and Hebrew, 2001). Michael R. Marrus is the Chancellor Rose and Ray Wolfe Professor of Holocaust Studies and dean of the School of Graduate Studies at the University of Toronto. He is the author of The Politics of Assimilation: French Jews at the Time of the Dreyfus Affair (1971); Samuel The Unwanted: European Refugees in the Twentieth Century (1985); The Holocaust in History (1987); and; Bronfman: The Life and Times of Seagram's Mr. Sam (1991). He is coauthor, with Robert O. Paxton, of Vichy France and the Jews (1981) and editor of The Nuremberg War Crimes Trial, 1945-46: A Documentary History (1997). Hans Mommsen studied history and German literature at the universities of Marburg and Tübingen and has taught at Harvard, Berkeley, the Hebrew University of Jerusalem, and Georgetown University. He has published widely on the legacy of National Socialism and the Holocaust. In 1999-2000 he was the Senior Shapiro Scholar in Residence at the U.S. Holocaust Memorial Museum in Washington, D.C.. He is the author of The Rise and Fall of Weimar Democracy, Die Geschichte des Volkswagenwerks und seiner Arbeiter im Dritten Reich (with Manfred Grieger), and two collections of articles, Von Weimar to Auschwitz: Zur Geschichte Deutschlands in der Weltkriegsepoche (1999) and Alternative zu Hitler: Studien zur Geschichte des deutschen Widerstandes. Gabriel Motzkin is director of the Institute of Arts and Letters and associate professor of history, philosophy, and German literature at the Hebrew University of Jerusalem. He is the author of Time and Transcendence: Secular History, the Catholic Reaction, and the Rediscovery of the Future (1992) and numerous articles on the philosophy of history. Susan Neiman was professor of philosophy at Yale University and Tel Aviv University and is currently director of the Einstein Forum, Potsdam. She is the author of Slow Fire: Jewish Notes from Berlin; The Unity of Reason: Rereading Kant; and Evil in Modern Thought (forthcoming), as well as a number of essays. Anson Rabinbach is professor of history and director of the Program in European Cultural Studies at Princeton University. He is also coeditor of New German Critique: An Interdisciplinary Journal of German Studies. His recent publications include In the Shadow of Catastrophe: German Intellectuals between Apocalypse and Enlightenment (1997). Amnon Raz-Krakotzkin is a lecturer in the department of history at Ben-Gurion University. He studies both early-modern Christian-Jewish discourse and Zionist historical consciousness. Among his publications are Censorship, Hebraism and Modern Jewish Discourse: The Catholic Church and Hebrew Literature in the Sixteenth Century; Exile within Sovereignty (Hebrew); Orientalism, Jewish Studies, and Israeli Society (Hebrew); and Redemption, Colonialism, and the Nationalization of Jewish History. His book Binationalism and the Critique of Zionism is forthcoming in Hebrew and French. Dana Villa teaches political theory at the University of California, Santa Barbara. He is the author of Socratic Citizenship (2001); Politics, Philosophy, Terror: Essays on the Thought of Hannah Arendt (1999); and Arendt and Heidegger: the Fate of the Political (1996). He is also the editor of The Cambridge Companion to Hannah Arendt (2000). Annette Vowinckel holds a postdoctoral fellowship at the Institute for Cultural Studies at Humboldt University, Berlin, where she is working on a book about Renaissance conceptions of man. She is the author of Hannah Arendt: Geschichte und Geschichtsbegriff (2001). Liliane Weissberg is Joseph B. Glossberg Term Professor in the Humanities, professor of German and comparative literature, and chair of the Program in Comparative Literature and Literary Theory at the University of Pennsylvania. Her publications on German and American literature, literary theory, and German-Jewish cultural studies include Cultural Memory and the Construction of Identity (with Dan Ben-Amos, 1999) and Romancing the Shadow: Poe and Race (with J. Gerald Kennedy, 2001). Her critical edition of Hannah Arendt's Rahel Varnhagen: The Life of a Jewess appeared in 1997. Albrecht Wellmer has taught philosophy in Frankurt am Main, Toronto, New York, and Constance. Currently he holds the Chair of Aesthetics, Hermeneutics, and Sciences Humaines at the Free University of Berlin. His English publications include Critical Theory of Society (1971); The Persistence of Modernity: Essays on Aesthetics, Ethics, and Postmodernism (1991); Cultural-Political Interventions in the Unfinished Project of Enlightenment (coeditor, 1992); and Endgames: The Irreconcilable Nature of Modernity (1998). Moshe Zimmermann is professor of German history and director of the Richard Koebner Center for German History at the Hebrew University, Jerusalem. He is the author of Wilhelm Marr: The Patriarch of Antisemitism (1986); Wende in Israel: Zwischen Nation and Religion (1996); Die deutschen Juden, 1914-1945 (Munich, 1997); and Deutsch Juedisch (2000). He is also the editor of the Hebrew volume The Third Reich: A Historical Evaluation (2000). For many years Hannah Arendt (1906–1975) has been the object of intense debate. 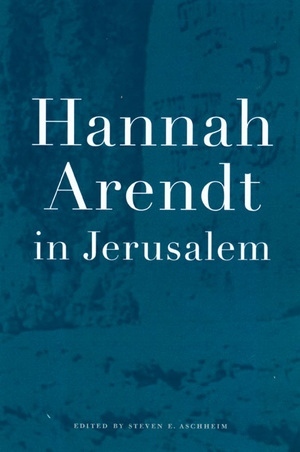 After her bitter critiques of Zionism, which seemed to nullify her early involvement with that movement, and her extremely controversial Eichmann in Jerusalem (1963), Arendt became virtually a taboo figure in Israeli and Jewish circles. 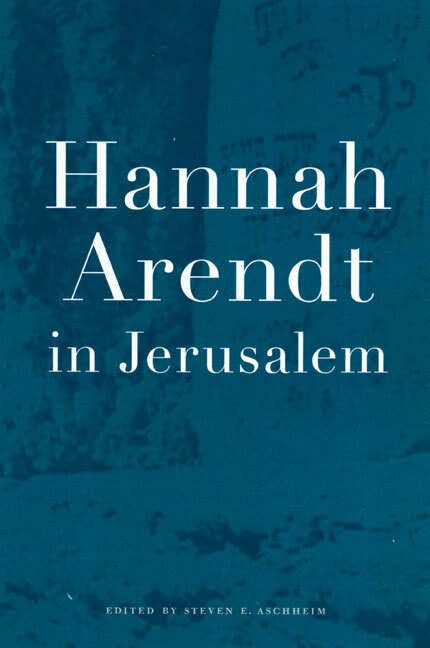 Challenging the "curse" of her own title, Hannah Arendt in Jerusalem carries the scholarly investigation of this much-discussed writer to the very place where her ideas have been most conspicuously ignored. Sometimes sympathetically, sometimes critically, these distinguished contributors reexamine crucial aspects of Arendt's life and thought: her complex identity as a German Jew; her commitment to and critique of Zionism and the state of Israel; her works on "totalitarianism," Nazism, and the Eichmann trial; her relationship to key twentieth-century intellectuals; her intimate and tense connections to German culture; and her reworkings of political thought and philosophy in the light of the experience of the twentieth century. Steven E. Aschheim is Professor of Cultural and Intellectual History at the Hebrew University, Jerusalem. His previous books include The Nietzsche Legacy in Germany, 1890–1990 (California, 1994), Culture and Catastrophe (1996), In Times of Crisis (2000), and Scholem, Arendt, Klemperer (2001).